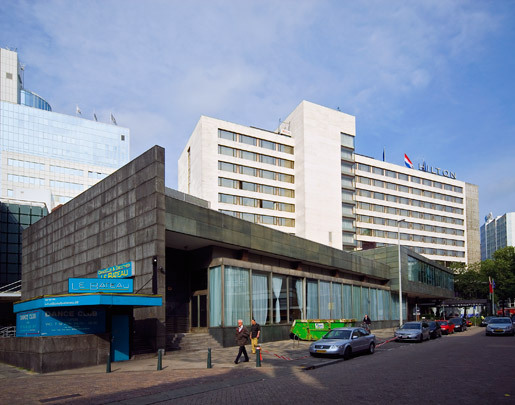 The Rotterdam branch of this hotel chain founded by Conrad Hilton was the third to be domiciled in Europe. Hilton Hotels are constructed to a uniform standard for both rooms and service so that its predominantly American users could immediately feel at home. Still, each hotel tries to inject something of the local context into its shops, bars and restaurants. In the rectangular, travertine panel clad upper storeys are eight levels containing 33 rooms and a 'presidential suite'. The basement, which follows the wedge shape of the site, houses general facilities including the foyer, restaurants and small shops.